This is the fabric that started it all. Everything: me thinking about my nieces and costumes, the whole project. 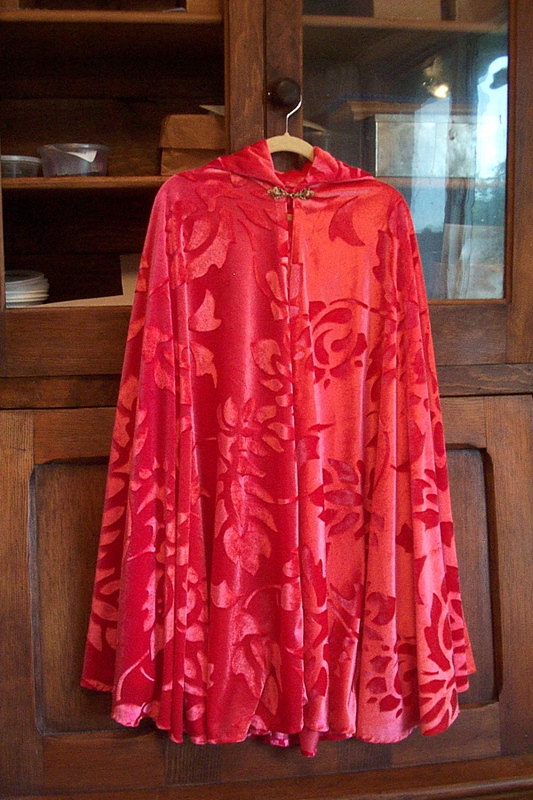 A Goodwill remnant of flaming rose velour! I lied. This is my favorite garment, not the chiton. The chiton required more ingenuity, but this took more time. Probably something to do with my need to hem things by hand. What can I say? I was brought up that way! I don’t always give in to the hand-hemming compulsion, but I always feel I ought to give in. 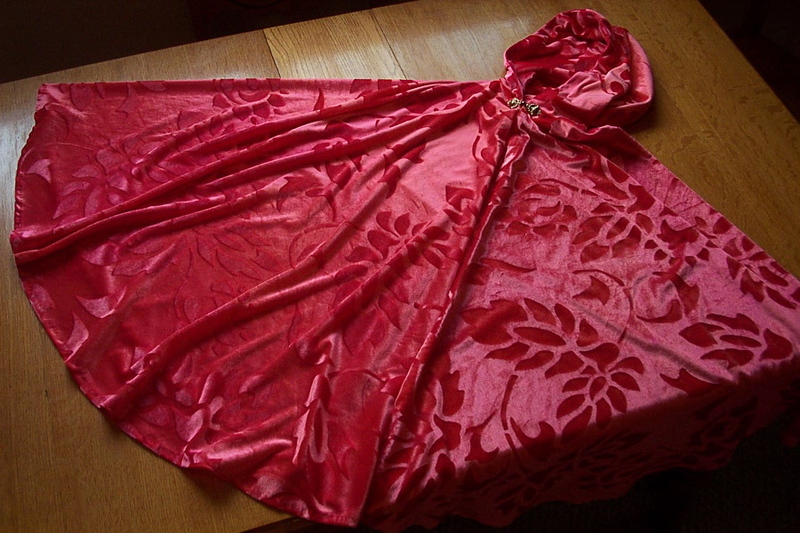 In this case the fabric was much too pretty to crush and stretch with seam lines, and much too fuzzy to use with the blind-hemming foot on my machine. 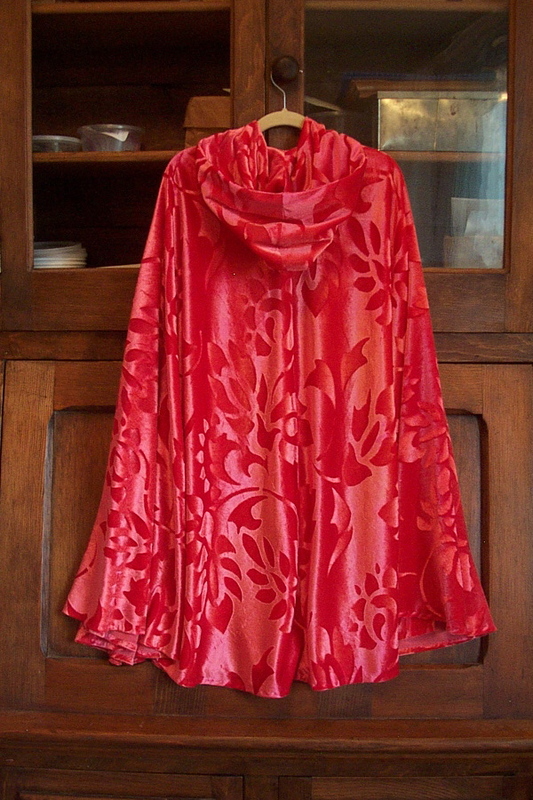 Did you know here is a lot of hand-hemming in a nearly circular cape? Perhaps it’s time to explain that I meant to make more boys-type outfits, but the medieval hat on the right is as far as I got. I left my planned Robin Hood tunic and velvet tabard and trailing black and silver villain-cape for last, but by the time I finished the garment you will see tomorrow, I REALLY wanted to be done and get everything to my nieces. I told myself I can sew the other boys’ things and send them later; maybe I will. My sisters loved to play Robin Hood when they were little, darn it. I even had all the fabrics. The blue velvet hat is made of trimmings from a curtain from the ever-popular As Is bin at IKEA. I used the same pattern that produced the Viking Girl Outfit: Simplicity 8004. Heavy duty interfacing for stiffness, blind-hemmed partial lining for the brim. I found the hawk feather on a walk a couple of days before I shipped The Box. It’s the first I’ve found. I love hawks. 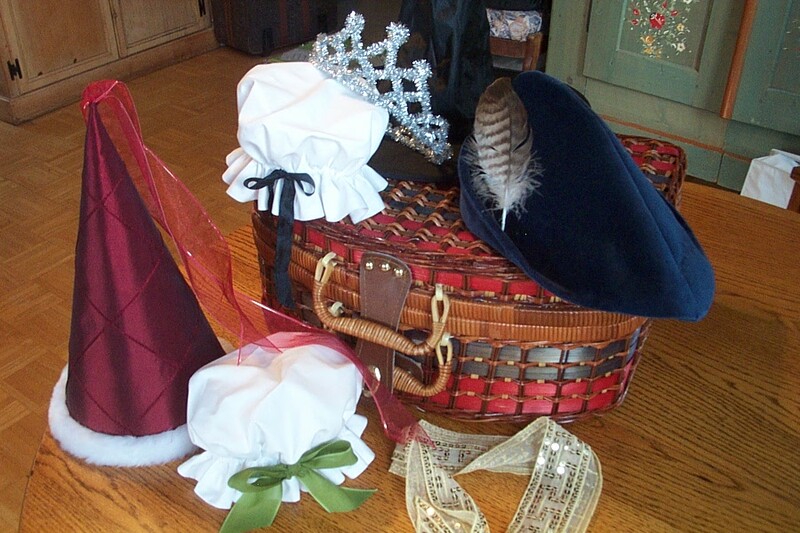 The conical princess hat is from the same set of cross-dyed taffeta curtains as the queeny wizard robe. 1” fake fur trim from the fabric store. 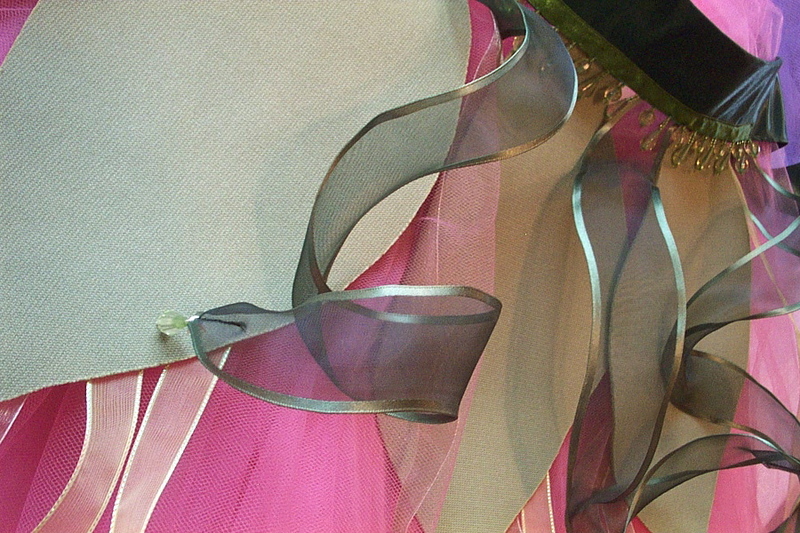 Floaty ribbon streamers. Aaand the mob caps. Let me just tell you, a lined mob cap is a fussier lot of sewing than it looks! I had all the round things out of my kitchen cupoards, trying to find the right combination of circles to trace for cutting lines and casing seams: trays, mixing bowls, pizza pans, pot lids. . . Like the eyelet apron, my sister tells me the exotic-ness of the mob caps made them immediately interesting to my nieces. The wire tinsel tiara was from my own costume box, and the black thing behind it is a boughten witch’s hat. Which just about covers it, don’t you think? The skirt was a women’s eight-gore skirt with a hidden side zip at Goodwill–so full and cheap I couldn’t resist, even though I could see it might be some trouble to cut it down. First I cut off the fitted waistband. That was easy. The hard part was picking out the many criss-crossing layers of serged seams securing the zipper For The Ages. I sewed up the side where the zipper had been and added a top casing from wide black bias tape to hold a new elastic waistband. 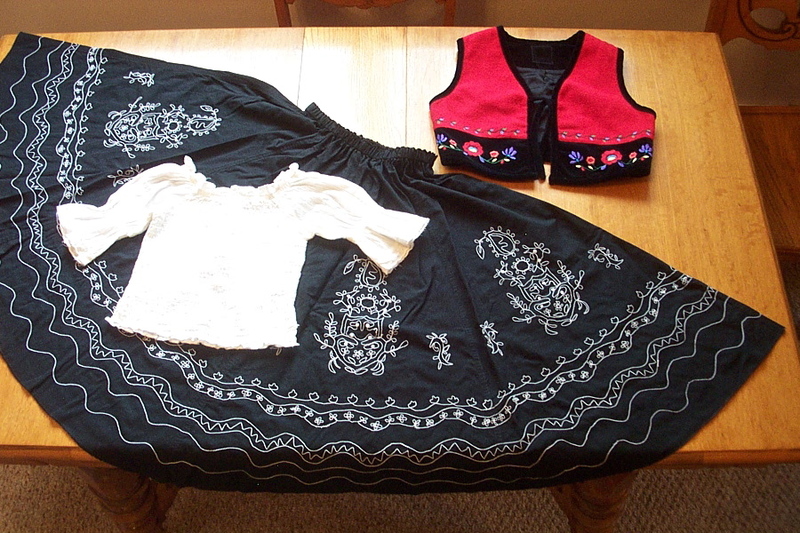 The skirt is ankle-length on my older niece, just the way the gypsies wore them. Were you fixated on any particular category of clothing in grade school? 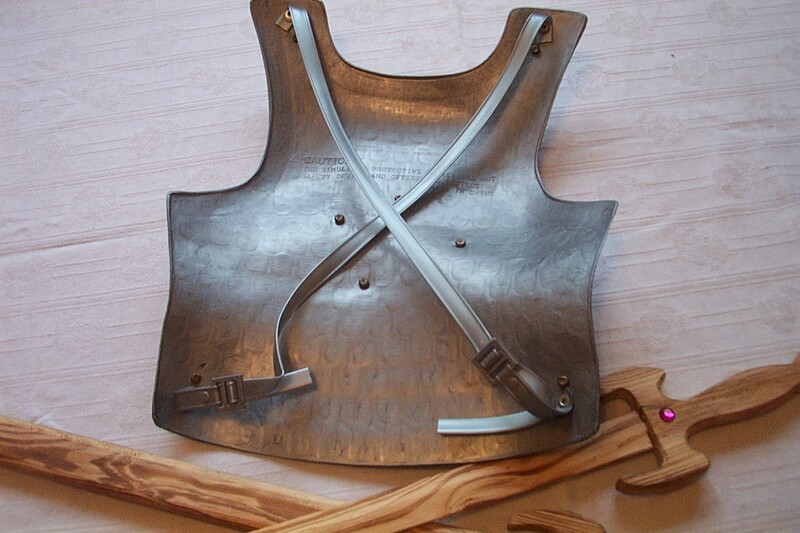 I never did get the vest of my childhood dreams, though I did get a very nice weskit when I was 13 or so. Two below-the-knee tutus purchased on eBay. Again I must excuse my camera. The pink one is a nicer rose color in person. The real costume is the leafy skirt. 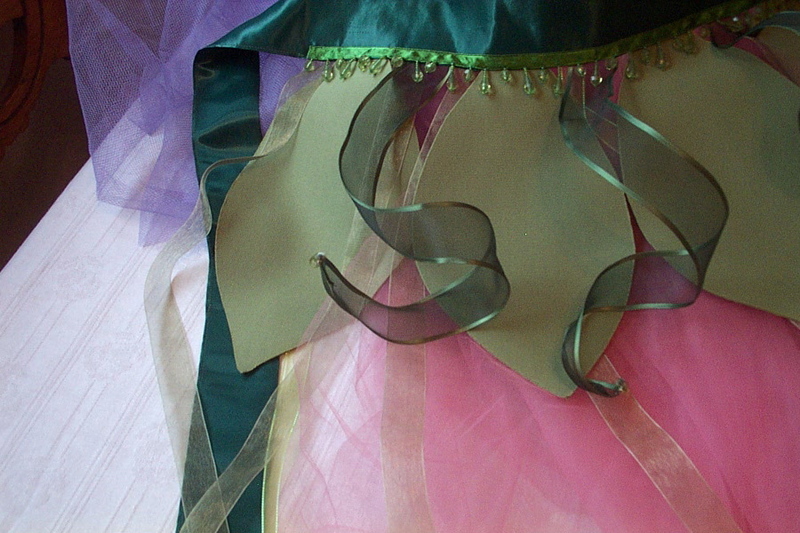 It can worn pixie-like over a plain leotard, or over skirts like these for flower fairies. 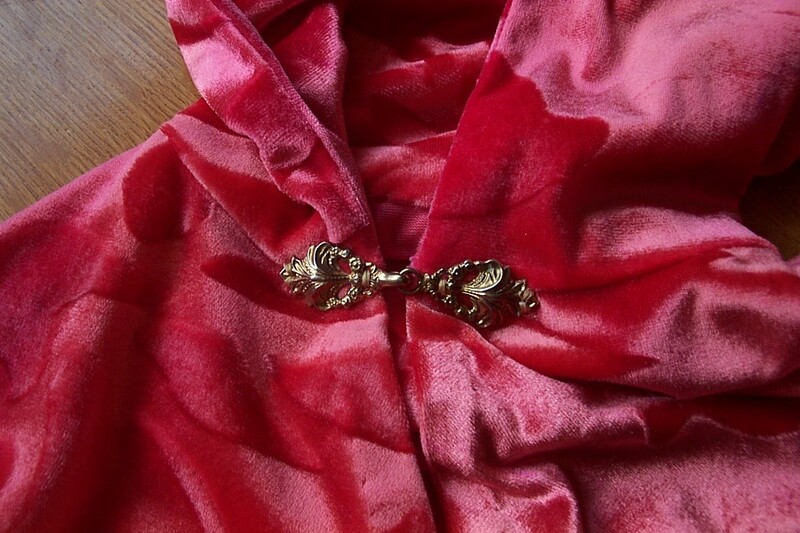 The waist band is satin blanket binding stiffened with fusible interfacing in the middle section. The leaves are made from a remnant of polyester double-knit. I fused two pieces together with a middle layer of “Heat-n-Bond Lite” to bulk it up to the right spongy stiffness, traced and cut leaf shapes, stitched them to the waistband. Beforehand I had cut and arranged random lengths of translucent light green ribbon to go underneath the leaves. None of this is botany, certainly, but I was thinking of sepals when I added the curls of dark green wire-edged ribbon on top of the leaves, sewed the ends to points (Fray Check stabilizes the the raw edges), and tipped them with faceted plastic beads of dew. Finally I stitched the waistband shut finished it off with beaded ribbon trim. It ties like a sash behind. 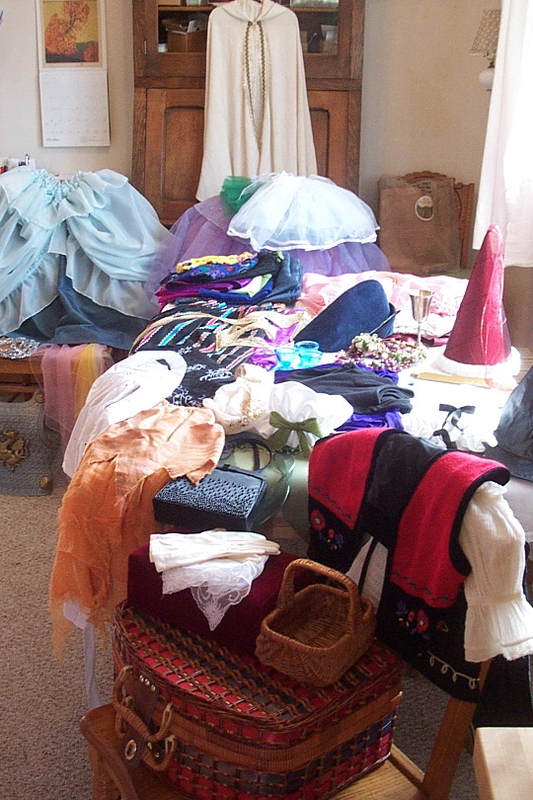 In assembling this costume box I was determined to avoid the tyrannical pinks of little-girldom: pepto, hot pink, and my own particular emetics (my tenderest years were spent in the 1980’s) the urply-purply “jewel-tones” of the family: fuchsia and orchid. The easiest way to avoid overused pinks is to avoid all pinks, but then I thought, that’s silly. As foolish to fear pink as pimp it. I would much rather rehabilitate pink, promote diversity of pinkness! What about coral? What about salmon, raspberry, and rose? Should they suffer for the sins of candy-floss? Which is my preface to telling you the photos are over-saturated, the fabric is actually a very pale shell pink. Spotting this material at the fabric store–its partial translucency and interesting drape–was what made me decide to try making a classical garment of some kind. As it turned out, a modified chiton. I thought of making up a muslin to make sure my idea of how to accomplish the garment I had in mind would work, but was too impatient. Anyhow the fabric was only something like $2 a yard. Two pieces of fabric went into the construction, front piece wider than back for a drapey front neckline. 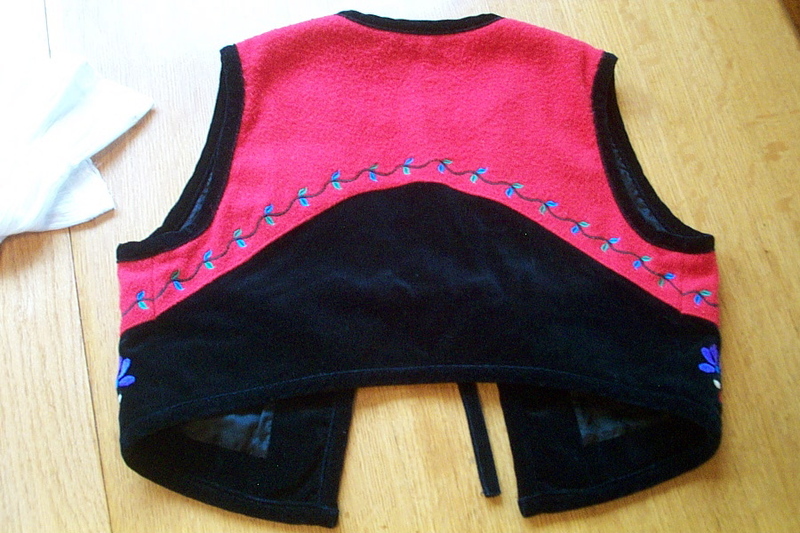 Graduated hem, two casings at each shoulder with stitched-in pull cords made from matching bias tape, and a tiny bit of shaping of the back neckline. Everything worked as I’d hoped except the curve I cut into the back neck. Once the hem was turned it made the neck hole too large. I made a box pleat in back to fix this. It’s off center! Know how it is when you measure two, three, four times, and still end up somehow not getting your tuck in quite the right place? 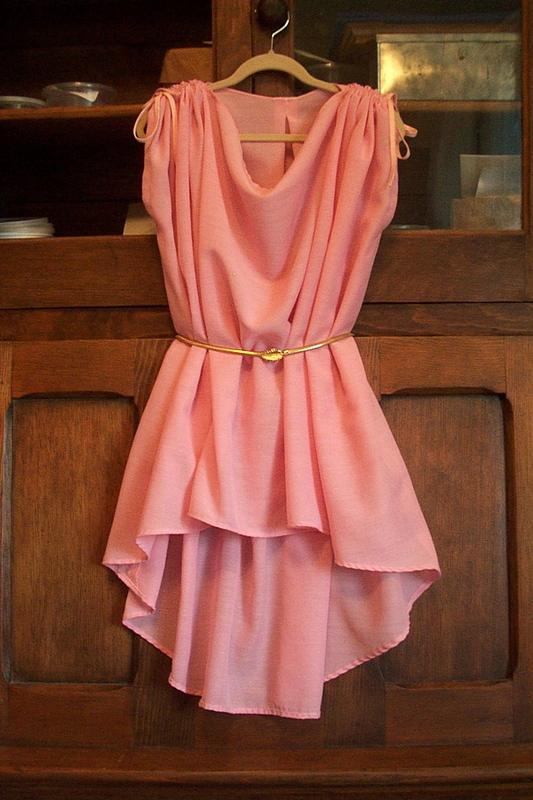 Despite its straying pleat and pinkness, this is probably my favorite of the garments I made for my nieces. 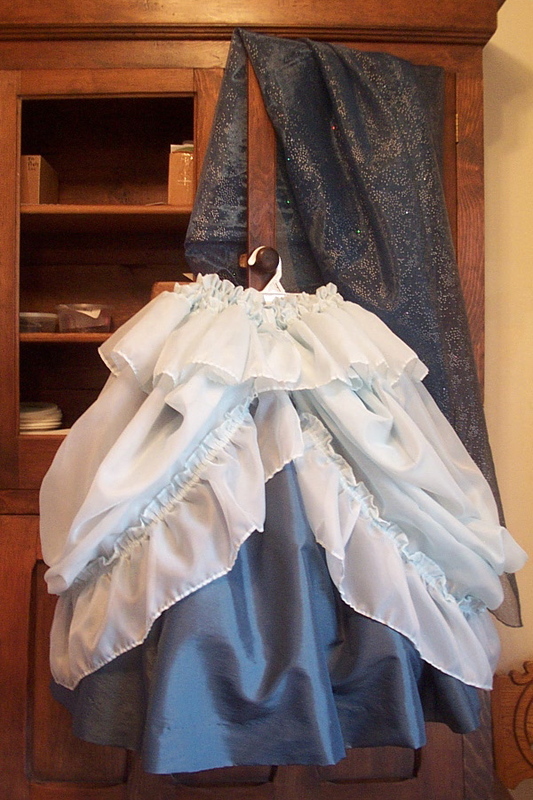 First I drew up a pattern for a very full bell-shaped gored skirt and sewed it in blue-grey taffeta. 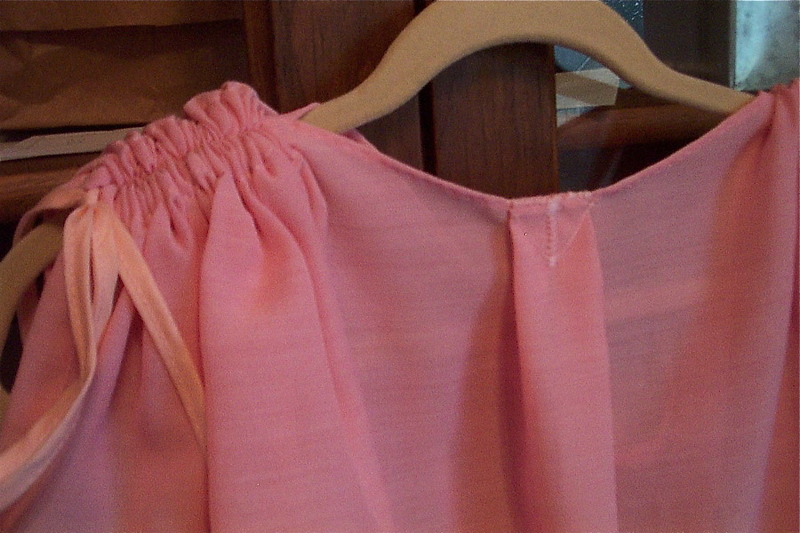 Then I fashioned the overskirt from some geriatric ruffled nylon curtains (Goodwill). A piece of coordinating sheer polyester yardage, hemmed on the raw edges, makes a sparkly night-sky wrap. 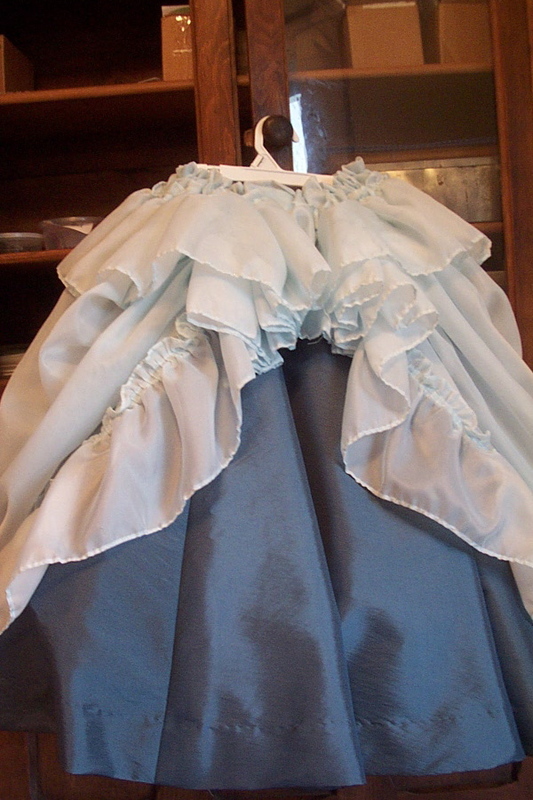 The skirts are worn over a crinoline and a light blue leotard. I had some material to work up into a bow or a rosette for the center of the waist, but I forgot about it until the day I was packing the box, so it didn’t happen. Here’s the back of the overskirt. You can see how it’s a bit poufier than the front because of the way the curtains were made. Time and again I’ve noticed little girls’ dramatic obsessions with beggar girls; with ragged, shivering orphans; with ill-used maids-of-all-work. Authors come by it honestly, I guess. Two layers of gauze, attached to an overskirt with an asymmetrically bias-dagged hemline. 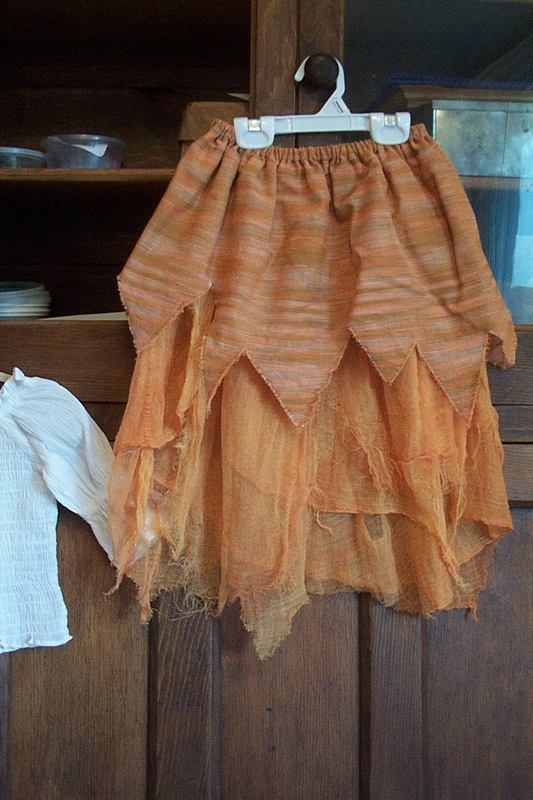 First I bleached cheesecloth (it was red-orange) just the way you’re not supposed to do, in order to achieve the mottled, faded results that would usually mean you had ruined your laundry. The gauze was left pretty ragged by this treatment, but I helped it along to achieve truly Cinderella-y tatters. 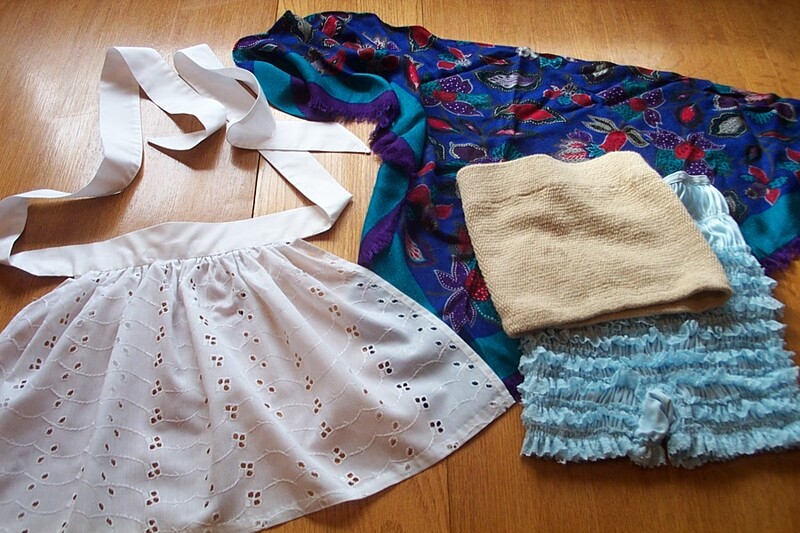 To be worn with the eBay-purchased peasant top on the left or, for the purist, sackcloth and ashes. It’s no good going to the ball if you don’t get to suffer for it first! This is me, but I think used nylon leotards are kind of nasty. 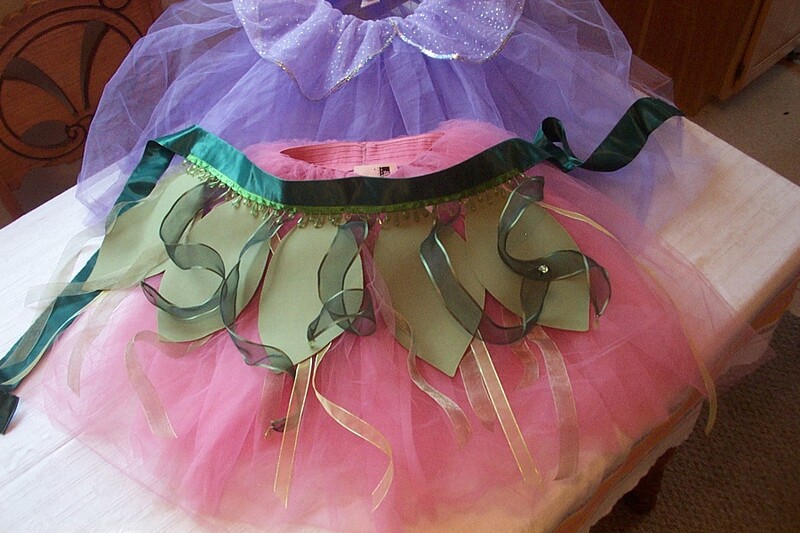 I have no objection to used tutus, but where does one find such a thing? I surely wasn’t going to spend months of my life pulling gathers into yards of tulle and stitching them to elastic bands, so I sprung (I use the term liberally), for some new tutus and leotards on eBay. Leotards are important for the whole mix-and-match concept. 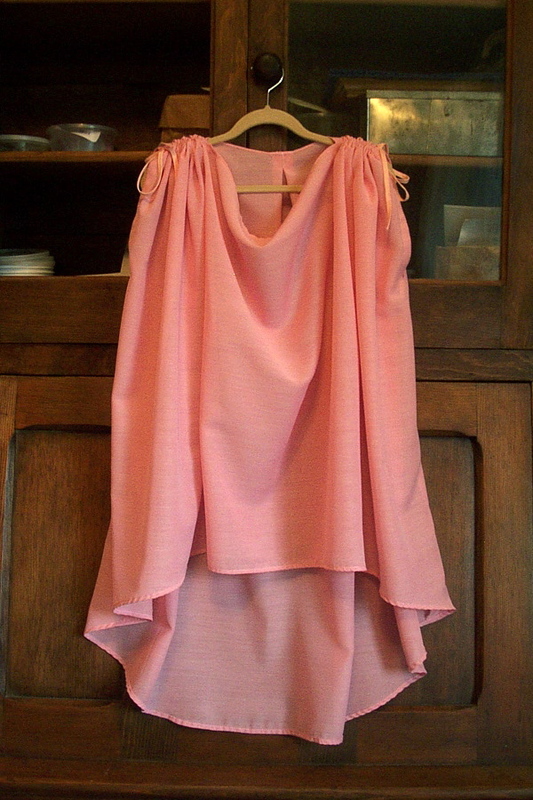 Most of the garments I made were intended to be at least semi-un-out-grow-able, which means they were skirts. I think of aprons as humble. 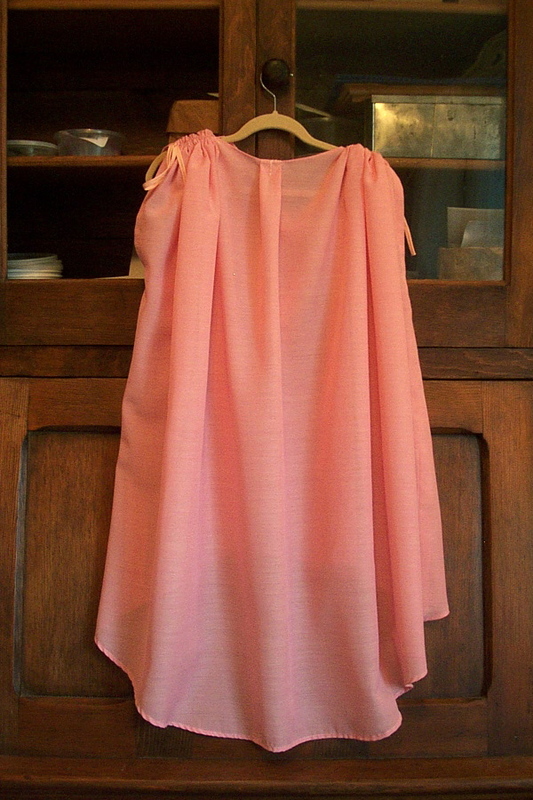 I sewed this one because I had an eyelet remnant and thought, that would make a tiny apron. It was one of those easy projects that turn out to be surprisingly time-consuming, what with the interfacing and hand hemming and basically figuring out how to make the thing. So here’s what’s funny: according to my sister, among all the glitter, my kindergarten-aged niece homed right in on the apron. To her, an apron is exotic–the perfect accessory for any number of olde-tymey characters. I’m glad I didn’t waste my time on it! A bright fringy shawl is, of course, a peasant staple. Are you working on your costume, yet? No? Putting it off until next weekend and reading blogs instead? 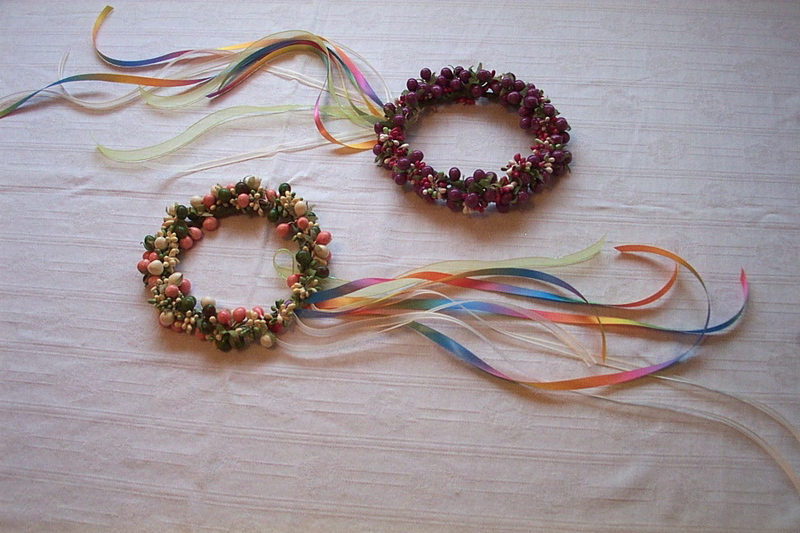 These are so my nieces can pretend to be flower fairies. Or knights. Or flower fairies with swords. Or knights in beribboned headgear. 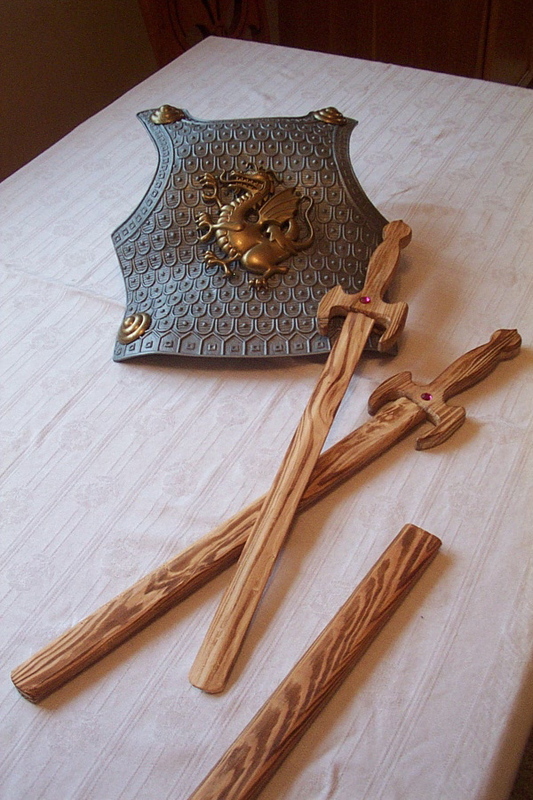 The wooden swords kept breaking in the mail or arriving otherwise defective, but the eBay seller just kept sending replacements until I had two good ones. One sword for two litte girls: not a good idea. I found the wreathes (of sprays of plaster globules) in what I call the Candle Crap aisle at Goodwill, which makes me think it was originally meant to go around candles. They were falling apart, so I reshaped them and wound them with florist’s tape to cover the ends of the wires, and attached some trailing ribbons. A headdress alone does not a flower fairy make. It will take me few more days to go through the fairy stuff.